for golf events, Mountain resort specials and what to do in the NC mountains. The golf courses in the mountains of North Carolina offer some of the most beautiful settings for a round of golf any where on the planet! Golf resorts as well as public golf courses are located in all areas of the Western North Carolina mountains. Many NC golf resorts offer golf vacation packages and discounts for both individuals and groups. 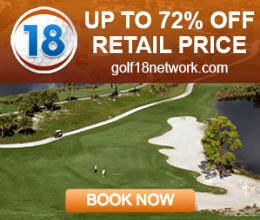 Save up to 75% on Top-Selling Golf Products at Golf Outlets USA! According to the National Golf Foundation, North Carolina is one of the five most popular destination states for golf travelers. Linville Golf Club was North Carolina's first golf course, which was built in 1895. Black Mountain Golf Club's 17th hole remains one of the longest holes in the world at 747 yards with a par of six. North Carolina has more than 70 golf courses ranked by Golf Digest as four star or higher. Pinehurst No. 2 and Wade Hampton Golf Club in Cashiers both ranked among the world's top 100 courses according to Golf Magazine. If you're looking for a golf vacation these golf resorts offer on site lodging and rentals and most include "stay and play" specials. Hotel-style guest suites with kitchens including stovetops, microwaves, refrigerators, and dishwashers . Resort amenities include an on site restaurant, private Lake Lure beach and marina, indoor swimming pool. High Hampton Inn and Country Club Historic Inn rooms and a variety of vacation rentals. On site restaurants and resort amenities. Special mountain golf packages are available - inquire for the current offerings. Cashiers Sapphire Valley. Hound Ears Lidge Clubhouse rooms and suites and a variety of vacation rentals. On site restaurants and pub. Blowing Rock NC. CellularOutfitter.com is one of the nation's top cellular accessories online stores with over 1,000,000 products shipped from US warehouses. Enjoy a beautiful mountain view golf course, spa services, a fitness center and a seasonal outdoor pool. Complimentary wireless Internet access is available in all 115 rooms, public areas and a computer station is located on site. Dining options include a restaurant and a bar/lounge.